Do you have trouble falling asleep during the warm summer months? When temperatures rise, it can be a challenge to stay cool and feel comfortable enough to fall asleep. As if that weren’t enough of a struggle, there may be extra noise in your home and neighborhood because kids are up late and playing, and neighbors are more likely to be outside making noise. 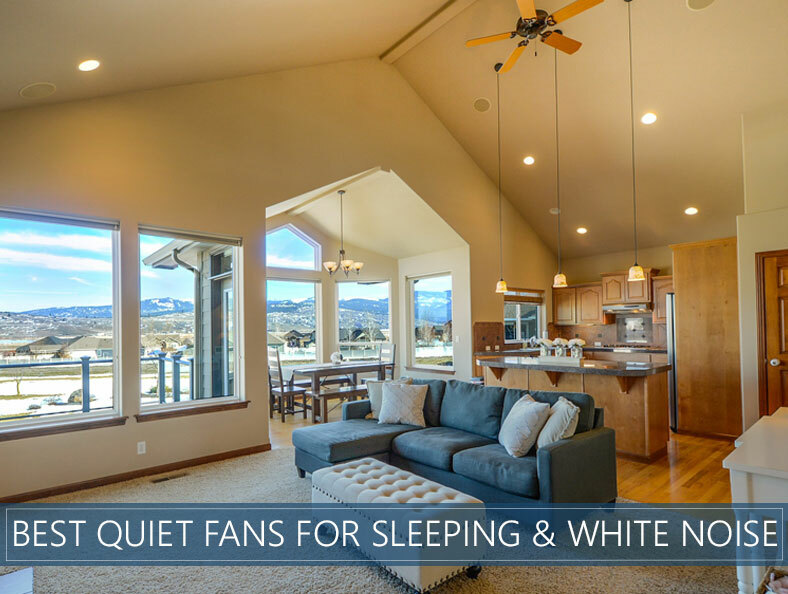 In this article, we’ll share our top 8 quiet fans for sleeping that are an economical and effective way to cool off while blocking out some of the extra noise that’s preventing you from getting your beauty rest. Unless you’ve got a powerful AC and a soundproof bedroom sanctuary, you’re probably looking for a solution like this, and we hope you’ll find the right one here. If you’ve got a compact space and want something modern, the Minka-Aire might be the perfect choice. The base can be installed flush with the ceiling, which is ideal for shorter ceilings. There are multiple colors and finishes to choose from, so you’ll be able to match your bedroom’s décor easily. There’s an option to use the included, low-profile LED light, or you can an opaque cover and skip the light. Options include brushed nickel, oil-rubbed bronze, polished nickel, and white. With a total blade span of 44 inches, this ceiling fan best fits small to medium sized rooms. If your bedroom is larger than 225 square feet, this may seem too petite, and you may want something with longer blades. For its size, it’s on the pricey end of the spectrum. However, this brand is exceptionally well-made and has a low estimated energy cost due to its energy efficiency. Also, if you’re looking for a quiet fan, this one definitely fits the bill. 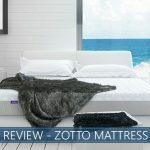 It’s been unanimously rated as quiet by nearly all customer reviewers. 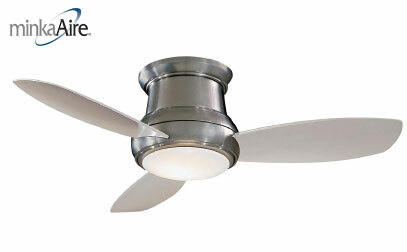 The Emerson CurvaSky ceiling fan is chic and compact, so it’s an excellent choice for modern décor. 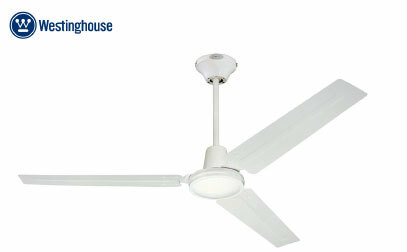 Like the Minka-Aire, it can fit well in a small or medium room because of its 44-inch blade span. 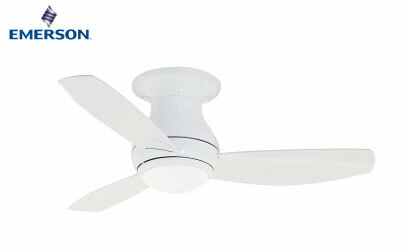 If you have a larger space, this fan is also available in a 52-inch blade option. The included light fixture houses two 50-watt mini-candelabra halogen bulbs. It does come with a solid plate that you can place over the space if you’d prefer not to have the light. Depending on your bedroom, you’ll be able to choose from three finishes: oil-rubbed bronze, brushed steel, and appliance white. If you’re thinking of placing the fan outdoors, the bronze and white finishes are graded for outdoor use. The Emerson comes with a six-speed handheld remote control, so you’ll be able to control the airflow. We’re a definite “fan” of the Fanimation brand! It looks right at home in urban homes and apartments with its sleek and streamlined design and modern finishes. Like the first brands, this one has the option to use a light with the base or an opaque cover instead. The bulbs designed for this unit are halogen, so if you’re looking to keep cool during the summer, you may want to switch out the lighting and use the cover. This model is good for shorter ceilings because it only has a 10-inch drop, making it one of the lowest profile units available. Choose from three finishes: matte gray, dark bronze, and brushed nickel. A couple of extra features we enjoy include a remote-control wall unit and a reversible motor, so you can enjoy this unit year-round. If you like the look and feel of the great outdoors in your living room or bedroom, you’ll likely love the Hunter Biscayne ceiling fan. It’s reminiscent of beaching at the coast or on a camping trip with the lantern-shaped light, the purposefully weathered blades, and the scripted logo. In fact, you can use this Hunter model outdoors, too, as long as it’s under a covered surface because the Hunter is damp-rated for outdoor use. It also has a reversible motor making it useful year-round. Two downrods are included, so you’ll be able to decide whether you want a two-inch or three-inch drop. Plus, longer downrods can be purchased separately for angled or extra tall ceilings. 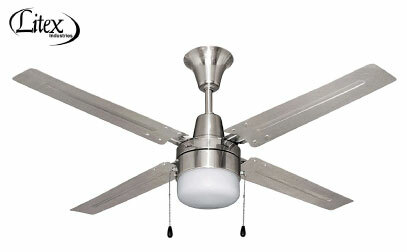 The Home Decorators Collection ceiling fan is a top choice among electricians and the mechanically-challenged alike. It’s a tremendous value, clocking in at about half the price of several competitors, yet with comparable quality. Installation is “certified frustration-free” with snap-on blades. There’s no need to worry about sway like there is with some other brands, and the instructions are very clear. The design is universally appealing and looks at home in both modern and traditional bedrooms. The only drawback is the lack of a remote control. To turn it on, off or adjust the speeds, you’ll have to use the pull chain mechanisms. 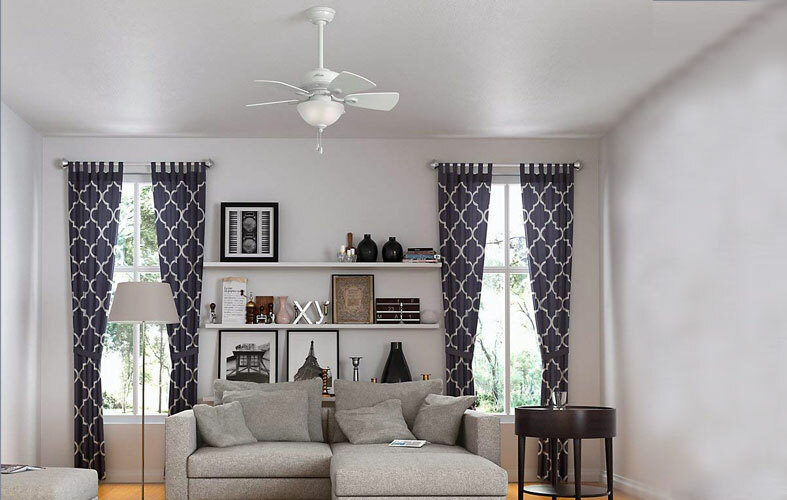 This ceiling fan combines both modern and traditional design elements. The brushed chrome has an urban feel yet, the base that mounts onto the ceiling has a curved shape that’s usually reserved for units that are meant for traditional décor. This unit lacks a remote-control element, so the pull chains are another anachronism. However, for people who find the remotes to be complicated or full of glitches, they’ll appreciate the control and lack of technical challenges. Alternatively, if you want the convenience of controlling it remotely or your ceiling is too high to use the pull chain, you can wire the unit to a wall switch. 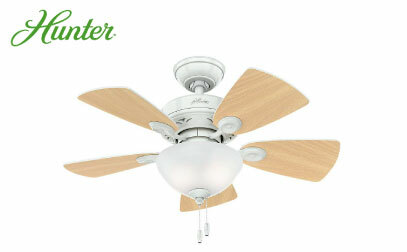 If you have a small room or you’re on a budget, you likely can’t go wrong with the Hunter Watson fan. It comes with the same quality that Hunter’s been their signature since the 19th century, but the price is very reasonable. There is even a scripted Hunter logo at the mounted base. Plus, the blades are double-sided with white on one side and oak on the other, so you’ll be able to customize the look of this unit without any extra expense. Our only potential issue with this unit is that it has to be installed with downrods, so it can’t be flush-mounted. In a small room, that means it can take up extra space. However, if your ceilings are 9-feet high or taller, you probably won’t take issue with this. If you’ve got high-ceilings, this may be the fan for you. The extra-wide 56-inch blade span looks right at home with ceilings that are upwards of ten feet. If you’ve got an industrial style or commercial setting, you’ll may also love this unit. The sleek, brushed nickel finish is both modern and elegant. Included with this unit is a five-speed wall control unit, which is helpful since there’s no pull chain and users aren’t likely to be able to reach the unit without a ladder! Also, the price of the Westinghouse is hard to beat! This chart will serve as a handy reference for you when you’re shopping for ceiling fans. We’ll talk more about room size and blade length in a moment. For now, we’ll share that there are no set rules; these are just guidelines to give you a frame of reference. As a general rule, the larger the room, the larger the fan. When we talk about size, we’re referring mostly to the length of the blades. The blades in the chart above are measured in terms of their span. Therefore, when we say a fan has 36-inch blades, that doesn’t mean that each blade is 36 inches long. Instead, it signifies the diameter of the unit from one blade to the other. Depending on the size of your bedroom, you may want a flush-mount or downrod system, which we’ll talk about in a later section. The length of the blades is a consideration for both the size of the room and the loudness. If you want the ceiling fan to operate as quietly as possible, err on the side of smaller blades. The limited wind resistance makes for quieter spinning. If, on the other hand, you want it to help with white noise, you may want to opt for longer blades that give off a sound that’s more like a distant and very muted helicopter. Consider your style and décor, and choose whether you’d prefer something traditional, modern, industrial or cottage chic. There’s no shortage of options to choose from! Flush mounting means that the base of the motor housing is mounted directly to the ceiling, so it’s “flush” with the surface. This type of system is perfect for lower ceilings. Imagine banging your head up against a moving fan. That’s a major hazard! A downrod mount means that there’s a rod that between where the support base is installed on the ceiling and the fan blades and motor. This system helps increase air circulation, but it’s only meant for ceilings that are nine feet tall or higher. Most downrod-style models come with two or three-inch rods. If you have a particularly high or angled ceiling, you may want to purchase an additional longer downrod separately. Fans are considered the original “white noise machine.” If you’re not familiar with these devices, they give off a whooshing sound (similar to the womb) that’s meant to both relax the sleeper and block out loud and disruptive noises. If you listen carefully, you’ll notice that fans also generate a gentle hum, or whoosh, sound that many people find helps them fall asleep. A common myth is that a fan cools down a room and drops the temperature; however, this is not the case. A fan does, fortunately, help keep you cool. Here’s how it works: as you sweat, the water on your skin needs to evaporate to cool you off. The air generated by the fan speeds up this process. Therefore, even though the room temperature is constant, you’ll feel cooler. No matter the season, bedrooms can become stuffy and stifling. If you sleep with your bedroom door closed, this problem can be quite pronounced, and even result in unpleasant odors in your bedroom by the time morning comes. A fan will keep the air flowing and circulating in the room, encouraging healthy breathing while dissipating odors. If you have sensitive or dry skin, a fan is likely to make the situation worse. Having a constant stream of air flowing over your body is bound to have a drying effect. You can balance the impact by using moisturizers, especially on your hands, feet, and face. Another potential challenge is dry eyes. People who sleep with their eyes partially open are likely to experience the feeling of dry eyes when they wake up. If you fall into this category, there are special eye drops you can use to help the situation. Your doctor may even have some prescriptions drops to recommend. Circulating air also causes other things in the room to move around, too! This includes dust pollen, and even mold spores. If you’re sleeping with a fan on in your bedroom, make sure that you keep your room as dust-free as possible. You may also want to eliminate flowers (or replace them with fakes) to prevent excess pollen from invading your nostrils. Some people complain of earaches or muscle pain when they sleep with a fan. This is usually due to the cool air blasting into their ears when they’re battling an ear infection or over their sore muscles when they’ve got soreness or an injury. To avoid this from happening, you can try abstaining from using a fan if you’re experiencing these challenges. Is sleeping in the heat recommended? Quite the contrary! Our bodies naturally drop in temperature at night to signify that it’s time for bed. This evolutionary mechanism dates back to the first days of humanity. 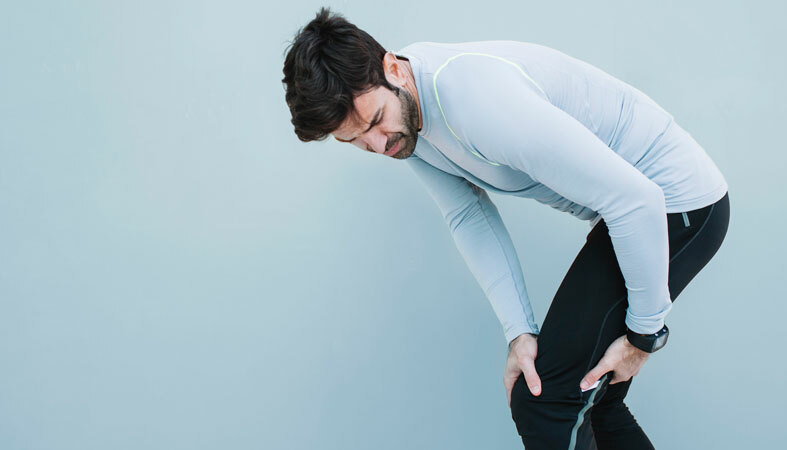 In order to fall asleep and stay comfortably at rest, we need a cooler environment to make it easier for our internal temperature to keep regulated. The ideal bedroom temperature for sleep is between 60 and 68 degrees. This range could be expensive or impossible to maintain during summer months, which is why having a quiet fan can be helpful. What is the quietest fan for sleeping? If you’re looking for quiet, the options mentioned in this article should be more than suitable. Just pay attention to the sound of the motor during your research. But again, any of the brands discussed here should satisfy your need for your quiet. How safe is it to sleep with loud fans? Some people have expressed concern about damaging their hearing by having a fan on in the room. You may find it reassuring to know that you won’t harm your hearing unless the sound of the fan is over 80 decibels, and it continues through the entire night. If you’re not sure how loud 80 decibels is, it would be the equivalent of a dial tone of a telephone directly in your ear. Unless it’s a huge industrial fan, we doubt your ceiling unit is that loud! If you're trying to get to sleep in a noisy room, especially during the warmer summer months, a fan may be incredibly helpful. Not only can it cool you off by evaporating any sweat that’s on your skin, but it can also lull you to sleep with the magic of white noise! Once you begin shopping for a new ceiling fan, you’ll find that there are thousands to choose from. We spent hours looking for the best, and we think you’ll be pleased with any of these models.